There's a massive movement affecting the Church that seems to go unnoticed by Christians. A "Churchquake" comparable to the Reformation is taking place. But this time it's not a move towards biblical doctrine of grace and faith, but the introduction of a new governmental structure and doctrines based on "revelations" and prophetic "words". The New Apostolic Reformation is an extraordinary work of God at the close of the twentieth century, which is, to a significant extent, changing the shape of Protestant Christianity around the world. For almost 500 years Christian churches have largely functioned within traditional denominational structures of one kind or another. Particularly in the 1990s, but with roots going back for almost a century, new forms and operational procedures began to emerge in areas such as local church government, interchurch relationships, financing, evangelism, missions, prayer, leadership selection and training, the role of supernatural power, worship and other important aspects of church life. Some of these changes are being seen within denominations themselves, but for the most part they are taking the form of loosely structured apostolic networks. In virtually every region of the world, these new apostolic churches constitute the fastest growing segment of Christianity. What Wagner refers to as the doctrine of the 1900's, and of the previous century, is unfortunately not classic evangelicalism, nor even conventional church doctrine of any kind, but esoteric cults, mystical philosophies and a motley collection of supposed "prophets" and thinkers who brought in unwelcome cultic tendencies involving contact with guardian spirits, angels and 'gods'. It was the old gnostic heresy warmed over and reproduced for another age. It culminated - in this century - in what is known as "sonship" or "Latter-Rain" or "Manifested Sons of God" teachings, and although there are differences between these movements, they are essentiually aiming in the same direction and calling for the same things. C. Peter Wagner, ed. Excerpt from, The New Apostolic Churches, published by Regal Books (1998). I will soon complete 30 years as a professor of church growth on the graduate level. During these 30 years, I have studied countless Christian churches of all sizes, in all kinds of locations, from new church plants to those hundreds of years old, spanning virtually every theological tradition, and rooted in varieties of cultures on six continents. I have reported my research the best I have know how in an average of one or two books a year. I have never been more excited about a book dealing with church growth than I am about this one, The New Apostolic Churches. Because I suggested to the other 18 authors that they begin their chapters with personal testimonies of how God has brought them to the places where they are now, I will follow suit. It will explain why I so excited. My mentor church growth research was Donald A. McGavran, the founder of the whole field of church growth. He is now with the Lord, but for years I have had the singular privilege of carrying the title Donald A. McGavran Professor of Church Growth. One of the most basic lessons I learned from McGavran was that the best way to discover what makes churches grow is to study growing churches. As a result, my first season of research, spanning the 1970s and into the 1980s, was spent doing exactly that. In retrospect, I now look at this as researching the technical principles of church growth. My mentor for helping me make a paradigm shift into what I now call spiritual principles of church growth was John Wimber, founder of the Association of Vineyard Churches and Vineyard Ministries International, to whom this book is dedicated. This began my second season of research, focusing first of all on the relationship between supernatural signs and wonders and church growth, then on prayer and spiritual warfare. This began in the early 1980s and continued to the mid-1990s. My third season of research is now focusing on the New Apostolic Reformation, the subject of this book. I am very excited because the new apostolic churches, better than any I have previously studied, combine, on the highest level, solid technical principles of church with solid spiritual principles of church growth. I will tell more about that later. How do these biblical principles unfold in real life? For 2,000 years, the Church of Jesus Christ has grown and spread into every continent. Jesus said, “I will build My church,” and He has been doing it. As we review those 2,000 years, however, it is quite obvious that Jesus does not always build His Church in the same ways. He did it one way in the Roman Empire before Constantine; another way after Constantine; another way in the Middle Ages; another way following the Reformation; another way during the era of European colonization; and yet another way post-World War II, just to name a few. Every time Jesus began building His Church in a new way throughout history, He provided new wineskins. While He was still on earth, He said that such a thing would be necessary: “Nor do they put new wine into old wineskins, or else the wineskins break, the wine is spilled, and the wineskins are ruined. But they put new wine into new wineskins, and both are preserved” (Matt. 9:17). The growth of the Church through the ages is, in part, a story of new wineskins. As I have tried to answer these questions, it is important to realize that I am a very traditional Christian. For decades I have been an ordained Congregational minister, and I still am. We Congregationalists came over on the Mayflower! I find myself in one of the oldest wineskins on record. Furthermore, I am a conservative Congregationalist (ordained in the Conservative Congregational Christian Conference). This was definitely an obstacle to my early church growth research because while I was a missionary in Bolivia I was anti-Pentecostal, and the fastest-growing churches in Latin America at the time happened to be Pentecostal churches. I finally overcame my biases, however, and, in 1973, wrote Look Out! The Pentecostals Are Coming! (Creation House). At that time, Pentecostal churches were one of the new wineskins, and their growth was showing it. That was back in the 1970s. What, however, are the new wineskins of the 1990s? Where does the blessing of God seem to be resting today? 3. Latin American grassroots churches. During the past 20 years, the largest churches that have been launched in virtually every metropolitan area of Latin America are largely those that are pastured by individuals who have had no formative experience with foreign missionaries or mission-initiated institutions. I would put these three together with rapid growth of the American independent charismatic churches I researched for the Dictionary of Pentecostal and Charismatic Movements, published by Zondervan in 1987. My article, entitled “Church Growth,” pointed out that this was the fastest-growing segment of Christianity in the United States in our times. What happened in 1993, then, was the realization in my mind that, indeed, pattern of divine blessing today on certain identifiable groups of churches is discernible (Question #3). The next question then becomes (Question #4): What are their common characteristics? In balance of this chapter, I will outline the nine most common characteristics of these churches I have been able to discern to date. My exposition and comments about each will, of necessity, be brief so as to keep the size of this chapter proportionate to the others in this book. I am simultaneously working on my textbook about the subject, which will provide abundant details. The title I am considering for the textbook is Churchquake!, which, to me, reflects the magnitude of change these new wineskins are bringing to the Body of Christ. In fact, I am sure we are seeing before our very eyes the most radical change in the way of doing church since the Protestant Reformation. Let’s take a brief look at nine components of the new wineskins that are shaping the Church for the twenty-first century. to a significant extent, changing the shape of Protestant Christianity around the world. Infinite creativity seems to be the watchword for assigning names to local churches. The “Crystal Cathedral” and “Community Church of Joy” are among prominent congregations in our country. “Icthus” churches are multiplying in England. On a recent visit to the Philippines I came in contact with “The Warm Body of Jesus Church.” One of my favorite churches in Argentina is “Waves of Love and Peace.” In Kenya, Thomas Muthee pastors “The Prayer Cave.” A friend told me of a church in Zimbabwe called the “Dodge the Devil and Go Straight to Heaven Church”! In my judgment, views of leadership and leadership authority constitute the most radical of the nine changes from traditional Christianity. Here is the main difference: The amount of spiritual authority delegated by the Holy Spirit to individuals. I have attempted to use each word in the statement advisedly. We are seeing a transition from bureaucratic authority to personal authority, from legal structure to relational structure, from control to coordination and from rational leadership to charismatic leadership. This all manifests itself on two levels: the local level and the translocal level. On the local church level, the new apostolic pastors are the leaders of the church. In traditional Christianity, the pastors are regarded as employees of the church. It is a question of trust. New apostolic congregations trust their pastor. Traditional congregations trust boards and committees. The difference between the two is enormous. The most passionate description of this difference I have yet seen is Lawrence Khong’s chapter 15 in this book. On the translocal level, one of the most surprising developments for those of us who are traditionalists is the growing affirmation of contemporary apostolic ministries. Our English “apostle” is a transliteration of the Greek apostolos, which means one who is sent out with a commission. This is an important dimension of what we are seeing, but the more surprising feature is the reaffirmation, not only of the New Testament gift of apostle, but also of the office of apostle. This is one of the first books I have seen that includes a chapter by one who designates himself “Apostle John Kelly,” much like the apostle Paul did in most of his Epistles. Training Although new apostolic pastors are fervently dedicated to leading their churches, they are equally dedicated to releasing the people of their congregations to do the ministry of the church. A characteristic of many new apostolic churches is an abundance of volunteers. Church member are normally taught that part of being a good Christian is to discover the spiritual gifts God has given them and to minister to others through those gifts as well as through any natural talents they might also have. Members of the paid pastoral staff of typical new apostolic churches are usually homegrown. As all the believers in the congregation become active in ministry, certain ones tend to rise to the top like cream on fresh milk, and they are the one who are then recruited for the staff. Because for many this involves a midlife career change, the possibility of their enrolling for two or three years in the residence program of a traditional seminary or Bible school is extremely remote. Therefore, academic requirements for ordination, so long the staple in traditional churches, are being scrapped. New apostolic ordination is primarily rooted in personal relationships, which verify character, and in proved ministry skills. Continuing education for leaders more frequently takes place in conferences, seminars, and retreats rather than in classrooms of accredited institutions. Little aversion is noticed for quality training, but the demands are many for alternate delivery systems. A disproportionate number of new apostolic churches, especially the large ones, are establishing their own in-house Bible schools. One of the most notable features o new apostolic churches, which traditional church leaders soon discover to their amazement, is the absence of nominating committees (to place lay leaders within the congregation) and of search committees (to locate and recruit new staff members). I can’t seem to recall ever finding out how many cells he did have in 1996. As far as the pastor was concerned, though, that apparently didn’t matter at all. In his mind, the 600 cells were not imaginary, they were real. The 600 was what really mattered. In only a few exceptions, new apostolic churches use contemporary worship styles. Contemporary worship is the one characteristic of the New Apostolic Reformation that has already penetrated the most deeply into traditional and denominational churches across-the-board. Many churches that would not al tall be considered new apostolic are now using contemporary worship in a least one of their weekend services. Worship leaders have replaced music directors. Keyboards have replaced pipe organs. Casual worship teams have replaced robed choirs. Overhead projectors have replaced hymnals. Ten to 12 minutes of congregational singing is now 30-49 minutes or even more. Standing during worship is the rule, although a great amount of freedom for body language prevails. As you scan a new apostolic congregation in worship, you will likely see some sitting, some kneeling, some looking at the ceiling, some lying prostrate on the floor, some holding up hands, some closing their eyes, some using tambourines, some dancing and some just walking around. The actual number of prayer times and the cumulative number of minutes spent in prayer during the worship service of new apostolic churches far exceeds the prayer time of the average traditional church. Worship leaders weave frequent times of prayer into singing worship songs. Many of them argue that true worship is, in itself, a form of prayer, so blending the two seems natural. A considerable number of new apostolic churches practice concert prayer, in a prayer language and some in the vernacular. At times in some churches, each one will begin singing a prayer, creating a loud, harmonious sound not unlike the sound of the medieval Gregorian chant. New apostolic leaders have been among the first to understand and put into practice some of the newer forms of prayer that take place in the community itself, not in the church. For many, praise marches, prayerwalking, prayer journeys and prayer expeditions have become a part of congregational life and ministry. Just as a matter of interest, as I am drafting this chapter, 55 members of one local church, New Life Church in Colorado Springs, are preparing to leave three weeks from now for Nepal, high in the Himalayas, to pray on-site for each of the 43 major, yet-unreached people groups of the nation. New apostolic churches experience relatively few financial problems. Although no vision-driven church believes it has enough resources to fulfill the vision adequately, and although financial crises do come from time to time, still, compared to traditional churches, finances are abundant. I think at lease three discernible reasons explain this situation. Second, giving is beneficial, not only to the church and its ministry in the kingdom of God, but also to the giver. Tithes and offerings are regarded as seeds that will produce fruit of like kind for individuals and families. Luke 6:38, which says that if we give, it will be given to us I greater measure, is taken literally. Planting new churches is usually an assumed part of what a local congregation does. The question is not whether we should do it but when and how. The same applies to foreign missions. One of the more interesting developments for a missiologist like me is that a large number of congregations are becoming involved, as congregations, in foreign missions. This does not mean they are necessarily bypassing mission agencies, especially new ones such as Youth With A Mission, but it does mean they are expanding their options for influencing their people to participate in a more direct and personal way in world outreach. Compassion for the poor, the outcast, the homeless, the disadvantaged and the handicapped is a strong characteristic of most new apostolic churches. Many other churches do a lot of talking about helping unfortunate people, but new apostolic churches seem to find ways to actually do it. The Vineyard Christian Fellowship of Anaheim, California, for example, distributes almost $2million worth of food to hungry people in their area every year. The Cathedral of Faith in San Jose, California, has constructed a million-dollar food distribution warehouse facility and it has become one of the largest food distribution centers in the state. Other local churches are doing similar things. I mentioned earlier that the New Apostolic Reformation seems to be combining the technical principles of church growth with the spiritual principles of church growth better than any similar grouping of churches I have observed. Even those new apostolic churches that do not consider themselves charismatic usually have a sincere openness to the work of the Holy Spirit and a consensus that all the New Testament spiritual gifts are in operation today. The majority of the new apostolic churches not only believe in the work of the Holy Spirit, but they also regularly invite Him to come into their midst to bring supernatural power. It is commonplace, therefore, to observe active ministries of healing, demonic deliverance, spiritual warfare, prophecy, falling in the Spirit, spiritual mapping, prophetic acts, fervent intercession and travail, and so on in new apostolic churches. The more I have studied the New Apostolic Reformation during the past few years, the more convinced I have become that we have a major transformation of Christianity on our hands. Don Miller titles his excellent new book on the subject Reinventing American Protestantism (University of California Press). By extension, I believe we are witnessing a reinventing of world Christianity. If that is the case, it is all the more reason to give God thanks for allowing us to be alive and active in His kingdom in these enthralling days. President of Global Harvest Ministries. For over thirty years Peter Wagner has been a professor of church growth and has observed Christian churches of all kinds around the world. What attracts his attention in particular are those congregations who are experiencing substantial growth. In the early 1970's, he wrote a book, "Look Out! The Pentecostals are Coming," because at that time the Pentecostals were the fastest growing segment of Christianity. For many years He taught at Fuller Theological Seminary, but resigned full-time in 1998 to become Chancellor of the Wagner Leadership Institute and continue his work as the head of Global Harvest Ministries. For the first sixteen years of their ministry, he and his wife, Doris, were missionaries in Bolivia. Because he also specializes in the field of missions, he was aware through the years of the growth being experienced among such groups at the African independent churches, the Chinese house churches, and the Latin American grass roots churches. "All of these were phenomena of church growth on a worldwide basis," says Wagner. "I also observed what was going on with the independent charismatics in America." It wasn't until 1993, however, that a general pattern began to emerge in his research. He began to notice that these different movements which no one had particularly associated with one another each had a number of commonalities. "That's when it first became clear to me that we had something to look into," recalls Wagner. "When we did, the most important characteristic that we found in these new churches was that they had a new authority structure which was different than that of traditional Christianity. That played itself out on the local level, with the pastor being the leader of the church instead of an employee, and on the translocal level, with the authority of the apostle over a number of churches." Wagner observed that in the place of bureaucratic authority, relational authority was being exercised. People's trust and loyalties were being placed in people, rather than institutions. "The African independent churches had placed incredible authority in individuals in the body of Christ," Wagner explains. "In the Chinese house churches, certain people were arising that had authority over literally millions of Christians. Then, since Latin America is my major field, I was noticing that in the urban areas there the largest churches were being led by very strong leaders who had had no contact with Western missionaries or mission-initiated institutions. Yet, they had churches of several thousand people and were leading them with a degree of authority that most of us were not used to." Over the course of the 1990's, it became evident to Wagner that a new reformation was taking place that was fundamentally reshaping the face of Christianity. "Every time Jesus began building His Church in a new way throughout history, He provided new wineskins. The growth of the Church through the ages is, in part, a story of new wineskins," says Wagner. "These new wineskins appear to be at least as radical as those of the Protestant Reformation almost five hundred years ago." Initially, in trying to describe what was occurring, he used the term, "Postdenominational Churches," which was eventually rejected because of strong protests from denominational friends and the fact that many of these new churches have remained within their denominations. The name he then settled on was the New Apostolic Reformation. "The New Apostolic Reformation is an extraordinary work of God at the close of the twentieth century that is, to a significant extent, changing the shape of Protestant Christianity around the world," Wagner explains. "For almost five hundred years, Christian churches have largely functioned within traditional denominational structures of one kind or another. Some of these changes are being seen within denominations themselves, but for the most part they are taking the form of loosely structured apostolic networks. In virtually every region of the world, these new apostolic churches constitute the fastest growing segment of Christianity." Within this reformation, Wagner sees a growing recognition of present-day apostolic ministries who are giving birth to their own family of leaders and churches to whom they have a relational, fatherly or motherly commitment to. "The biggest difference between New Apostolic Christianity and traditional Christianity is the amount of spiritual authority delegated by the Holy Spirit to individuals," Wagner emphasizes. "In tradition Christianity, authority resided in groups such as church councils, sessions, congregations, and general assemblies. New Apostolic Christianity sees God entrusting the government of the church to individuals." Within New Apostolic Christianity, Wagner sees this governmental authority being exercised in the local church by the pastor and on a translocal level by apostles who operate with a relational authority rather than a hierarchical, bureaucratic one that had typically been exercised through denominational structures. "The other important thing with regards to this authority is that allegiance or relationship with the apostle is voluntary," adds Wagner. "There is nothing that holds the pastor or the church related to the apostle in the apostolic network except the perception that the apostle is adding value to their life and ministry." Apart from authority structures, Wagner cites a number of other characteristics which are common among new apostolic churches around the world. Perhaps the one that has permeated the rest of Christianity the most is the contemporary worship style which was pioneered within these churches and is now seen among congregations in virtually every denomination. "Whether the other aspects of the New Apostolic Reformation will have the same type of influence, I don't know. But worship already has," Wagner says. There is also a paradigm shift concerning the training of leaders. In new apostolic churches, there is an expectation that everyone in the congregation is a minister. As people then are active in the local church, certain individuals who are specially gifted or anointed by God will surface. Therefore, instead of colleges and seminaries being the primary incubator for leaders, local congregations become the place where new leaders emerge to assume responsibilities on both paid and voluntary levels. "In New Apostolic Christianity, an average church of about two hundred people would have a lot more people actively involved in all aspects of church life," notes Wagner. "Members are not only expected to attend church, but they are expected to receive ministry when it applies to them and also minister to others when called upon. For example, last Saturday night at our church, Pastor gave an invitation for those who felt they were not putting the Lord first in their lives, and around fifty people came forward. Then, he asked other mature Christians in the congregation to come forward and pray for them. This is just part of what you do when you go to church. You lay hands on people and pray for them, and let others lay their hands on you if you need it." One of the other significant characteristics of new apostolic churches that has also been observed is the relatively few financial problems which are experienced compared to traditional Christianity. This is due to the fact that the leadership of the churches simply expects every member to be faithful with both their tithes and offerings. "There is a strong teaching in these churches that giving benefits the giver," Wagner explains. "Not just in terms of making the giver feel good, but it actually benefits them in terms of financial prosperity. So not only do people like to give, they have more to give." Wagner also points out that new apostolic churches have become more proactive in prayer in comparison to traditional Christianity which has been a great source of evangelistic effectiveness. "Prayer has always been a part of every church I have ever been a part of, but they have not been proactive in understanding how prayer directly relates to the work of the Holy Spirit in the lives of the members of the congregation and to the task of the church moving out to evangelize the community." 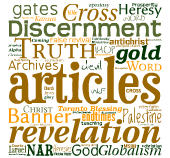 Wagner sees what is happening in the New Apostolic Reformation as key to world harvest. With the spread of the gospel being accomplished around the world through apostolic networks rather than through denominations starting churches that are somehow tied to their bureaucracy, he believes the pace will quicken.
" World harvest is a work of the Holy Spirit," Wagner emphasizes. "What amazes me with traditional Christianity is that we pretty well had our government backwards and yet we were able to evangelize much of the world. But now since we are beginning to understand true order, I believe the most aggressive, abundant harvest is yet ahead because the Lord is going to be able to work in an even more powerful way." "There is an interesting paradigm shift occurring in missions," he continues. "The focus is no longer on denominational agencies doing world missions, but local churches getting directly involved in spreading the gospel in other lands. It just stems from the fact that outreach is just part of the DNA of the church. It's something we do whether it is convenient or not or whether we have everything else done or not." One key issue which arises involving apostolic networks is the issue of accountability. Who are the apostles accountable to? "Obviously, they are at the peak of their networks. The people in their network are accountable to them, but what are they going to do?" Wagner asks. "I believe that if this question is not adequately answered very shortly, it's going to harm the integrity of the whole New Apostolic Reformation. But I think it is being answered. The consensus is that apostles must be accountable to other peer level apostles." Wagner is personally involved in an accountability structure called the New Apostolic Roundtable. Twenty-five apostles were invited to join as members, and they plan to meet together annually the week after Easter. Their purpose is to gather peer level apostles together to hold one another accountable. Eventually, the names of those involved would be made public so people would know these people have submitted themselves to each other. "However, in order that true accountability occurs, group dynamic theory kicks in," Wagner elaborates. "You couldn't much go over twenty-five people and have a meaningful accountability group. So we must limit the size of it. At last count, I have identified at least ten other similar groups in our country and around the world that have either already formed or are beginning to form. Some are not explicitly for the purpose of accountability, but that's how they will function. This is a very good sign. Although cross-pollination does happen in these groups, I believe that accountability is the core factor." Because this movement is growing so rapidly around the world,Wagner also sees a need for a larger kind of structure where the main purpose is not accountability, but networking and communication. As a result, he and a number of others have formed what they call the International Coalition of Apostles. They sent out their first invitations in January of this year and have just passed one hundred and fifty members. Wagner expects that they will ultimately attract from five hundred to a thousand members, which are solicited by invitation only. They plan to hold an annual meeting along with occasional regional summits across America and around the world. "Our basic goal is to get apostles together on a regular basis to build relationship," says Wagner. "My dream is that from this would form any number of these smaller, tighter accountability groups." He is also quick to make it clear that he does not consider the International Coalition of Apostles as the only worldwide entity of its kind. "We hope that several of these kind of networking structures would form to get apostles together," Wagner emphasizes. "When they do, we will know each other are there, and the leaders will meet to see what God has in store for us in the future. I am just using my influence to make sure that these apostolic networks don't get into competition with one another." When asked what he thought the main stumbling block would be that would keep leaders from embracing the New Apostolic Reformation, Wagner cites a commitment to tradition amongst ministers. "I think that some are bound by religious forms and functions that are ineffective, and I think in many cases it is a demonic influence," says Wagner. "There is a way that local churches can operate on a new apostolic model and still be in a denomination, but when it come to the denomination itself, it is very difficult for that change to take place. In all my research, I still have only found one in which this transition has happened, which is the Australian Assemblies of God." Another area where the role of apostles is discussed more readily in the Church today concerns the organization of Christian leaders in a community for the purpose of evangelizing the city. These initiatives, commonly referred to as "city reaching" or "city transformation" efforts, involve the banding together of local pastors and para-church ministries in order to reach the lost and, as Wagner states, "penetrate the entire society with the values and blessings of the kingdom of God." In his new book, "Apostles of the City: How to Mobilize Territorial Apostles for City Transformation," Wagner attempts to define what the role of these apostles might be and address some of the frustrations and flaws that have surfaced in most city-reaching efforts. "The apostles of the city are Christian leaders who have made a commitment to the city and to whom the Holy Spirit gives an anointing of extraordinary authority in spiritual matters over other Christian leaders in the same city," Wagner explains. "The apostles bring spiritual government to the pastors of the city so that the pastors of the city can do the job that God has given them in a much more effective way. The only thing is that the pastors of the city have to recognize the existence of apostles and be willing to acknowledge their governmental role. This hasn't happened too much yet." While not excluding others, Wagner hypothesizes that the most extensive pool for identifying apostles of the city is among the mega-church pastors. He also points out that in most cities there will be a number of apostles, each with their own sphere of influence who could come together on a peer-level basis to form an apostolic council for the city. "It may well be true that pastors of dynamic, growing churches of over seven hundred to eight hundred will always have an accompanying gift of an apostle," Wagner relates. "What would come out of this would be a small group of visionary, initiating, risk-taking, task-orientated leaders who would not threaten each other because they have nothing to prove." "One of the mistakes we have made in terms of city-transformation organizations has been excluding the mega-church pastors," Wagner continues. "It's usually not an overt exclusion, but by structuring our processes in such a way that mega-church pastors tend to exclude themselves. In some cities because they have done this, they have incurred the wrath and criticism of other pastors. In other cities, there is less criticism as indifference towards mega-church pastors and they are given marginal roles which are really not effective." In his new book, Wagner cites Ted Haggard, a mega-church pastor in Colorado Springs, who said, "The biggest church in town often doesn't even participate in the network of churches, either because they weren't invited or because they believe the network is too inactive in terms of citywide strategy. In the coming years this will change. Mega-churches will initiate relationships with other churches in the city, and more local churches will begin to turn to the mega-church leaders, who are often proactive and visionary, to develop a citywide strategy." Wagner notes that extra-denominational alignments are already occurring which provide the ideal social structure for recognizing apostles in a city. Many pastors who are involved in local groups find that their relationships there are growing stronger than those with pastors in their own denominational structures. He sees it highly probable that we will begin to see the development of "spontaneous territorial spheres which rise to a higher importance than traditional denominational affiliations." "The only way this can possibly play itself out would be by the other people in the city recognizing that the apostle will add value to their own ministry. If this does not happen, change will not occur," explains Wagner. "The whole idea of recognizing the gift and role of an apostle is a really big change in the way we see church. The one thing that has surprised me is the lack of opposition to this. I haven't seen an awful lot of criticism or opposition to it as has developed over other issues." In Colorado Springs where Wagner lives, Pastor Ted Haggard of New Life Church has been officially recognized as an apostle of a certain sphere of churches called the NET. "The pastor of the other mega-church in the city, Woodmen Valley Chapel, New Life's competitor-and I choose that word deliberately-made a tough decision to leave and become one of Bill Hybel's closest associates at Willow Creek," Wagner relates. "After he left, the elders of Woodmen Valley Chapel called Ted in as a consultant for choosing a new pastor. That was absolutely extraordinary." There is no doubt that the greatest change in the Church since the Protestant Reformation is taking place before our eyes. Not only is it affecting the way local churches are operating, but it is changing the paradigm of traditional denominational structures and giving birth to new interdenominational alliances. And it is all pointing us towards world harvest. "The thing that attracted me to studying this was the incredible rate of growth among this segment of Christianity, and a lot of that growth is taking place among the younger generation," Wagner concludes. "This is a new wineskin that's going to appeal to them, and I think we are going to see a lot more people giving up traditional systems to embrace this more relational kind of organization." Peter Wagner is author of "New Apostolic Churches" (Regal, 1998), "Churchquake" (Regal, 1999) and "Apostles of the City" (Wagner, 2000) which deal with the New Apostolic Reformation.